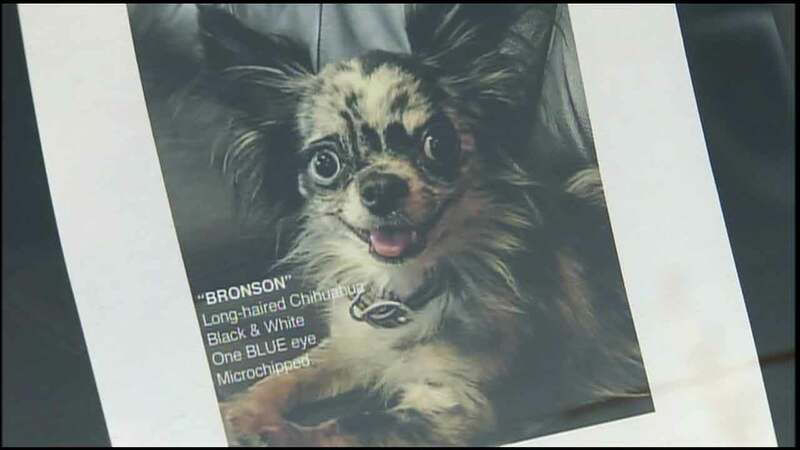 An undated photo of Bronson, a Chihuahua that went missing on Dec. 5, 2015. WEST HOLLYWOOD, CA -- The owner of a dog missing since Dec. 5 is pleading for his beloved pet's safe return. The Chihuahua, named Bronson, has been featured in a commercial. He is described as having one blue eye and one brown eye. His owner, Jason Christopher, at first thought he was lost until a friend saw the posters he put up and realized that she picked up Bronson when he ran off from the gym. A woman driving by in a silver BMW 5 series told the friend it was her dog and gave Bronson to that woman. "I'm not looking for anything other than my dog back. There's a $10,000 reward and I can make more money, but I can't replace what she's taken," said Christopher. "And I'm not seeking legal action, I'm not seeking... this can be done completely anonymous." Christopher said Bronson is a registered service animal and has helped him recover since the death of his mother. He said the Los Angeles County Sheriff - West Hollywood Station was investigating the incident.